Seeing as I follow a lot of restaurants and foodies on my social media channels, it’s common for me to see charcuterie boards in my feed. Almost as much as latte art! It seems that everyone is as obsessed as I am with them. I enjoy eating off of them but I only recently learned the essentials of how to make a charcuterie board. In case you’re wondering, charcuterie, pronounced shahr-koo-tuh-reee is a French term meaning cured meats. Back in the day, they were at every party or gathering…we called them meat and cheese boards, lol! Don’t dare call it that today! People love to correct you and say “you mean charcuterie board., dahling!”…..I know they don’t really sound that way but that’s what I hear, lol. 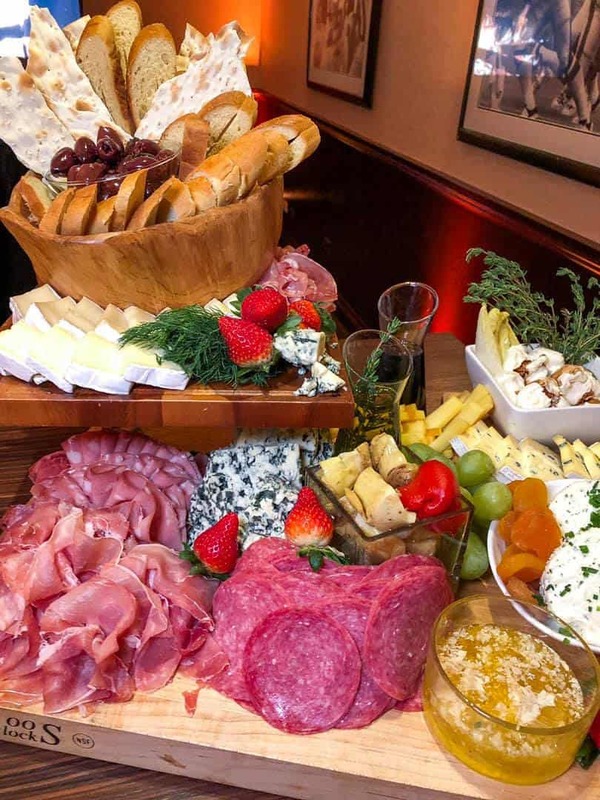 I feel that they just like saying the word charcuterie as do I.
I’d learned the components of a great charcuterie board when I had an evening out with author and entertaining and lifestyle expert Maureen Petrosky. Perhaps you know of her from her frequent lifestyle and hosting segments on the TODAY Show. She showed us all how to up our hostess game when entertaining guests. She emphasized not being intimidated when it comes to hostessing guests. One doesn’t need to be a chef to put together an impressive spread. What I most appreciated about the information was that she didn’t make you feel like you had to break the bank to entertain. Just be creative! My evening out with Maureen was hosted at Old Town Social in Chicago’s Old Town neighborhood. She’d beautifully styled the space with gorgeous table arrangements and fresh flowers, all sourced from local providers. Guests started the evening off with hors-d’oeuvres and cocktails created by Maureen using Jack Daniels whiskey. They were quite good, my favorite being the Tennessee Mimosa: Sparkling wine, rosemary, whiskey, and OJ. I wasn’t aware that Jack Daniel’s had a variety of cocktail recipes on their website. Good information when you’re planning your next party! We followed the cocktails with a whiskey tasting and a discussion on pairings. Following the tasting came what I was most excited for; Maureen was going to share her secrets and teach us how to do a charcuteries board justice. She created a variety of boards for us to nibble on at our tables. The meats she used were all smoked in-house at Old Town Social. We enjoyed a selection of Coppa, Lonza, Finnocchiona, Toscano, and Soppressata. The crackers and jam were also made in-house from scratch. The strawberry jam was eye-rolling good! It consisted of strawberries, lemon juice, and sugar. Basically, the perfect charcuterie board needs to have representation from several categories. Fortunately, we were all provided us with a cheat sheet so that we wouldn’t have to recall these by memory after having several cocktails. Here’s my creation! This board was so inexpensive to make. I found the majority of my ingredients at ALDI and the jams came from Rise ‘n Roll, an Amish bakery located in Valparaiso, IN. Entertaining without breaking the budget is GOLD! They’re also easy to throw together at a moments notice! Are you a charcuterie lover? Tell me what would go on your board in the comments!